Did Race Play a Role in the Recent Departure of a Burlington Principal? 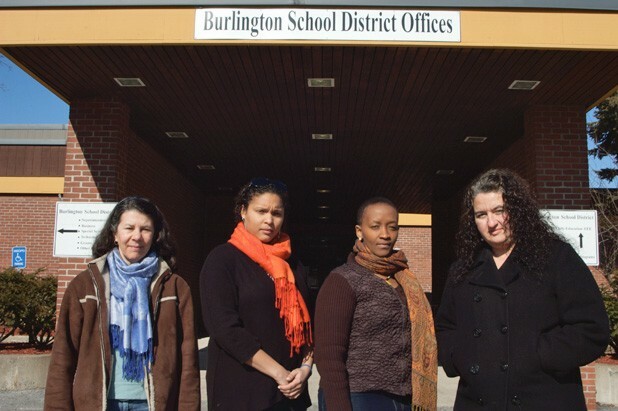 Does the Burlington School District have a race problem? Definitely, according to more than a half dozen current and former BSD employees who claim the district isn’t a very accommodating or inclusive place for people of color. They point to last week’s resignation of Trevor Christopher, coprincipal of the Integrated Arts Academy at H.O. Wheeler, as the latest example of a nonwhite person rumored to be leaving the district because of concerns about racial insensitivity and cultural incompetence. On February 13, BSD superintendent Jeanne Collins announced that Christopher was resigning his post effective June 30 and going on immediate medical leave due to injuries he sustained last fall. The press release offered no further explanations for Christopher’s departure, nor did it include a statement from the outgoing principal himself. But others allege that of more than a dozen people of color who have been hired by the district in the last two years, at least six have either resigned or are considering resignations. The district’s attrition rate for faculty and staff of color could not be independently confirmed, in part because such data aren’t necessarily communicated to the district and are sometimes based on anecdotal information. Nevertheless, some who are working to create a more equitable work environment suggest there’s a problem. One person of color who says she resigned from the district because of its intolerant racial climate is Jeanine Bunzigiye. The Congolese native and Burlington High School graduate spent several years as a paraeducator and home-school liaison for newly arrived African immigrants. Bunzigiye, who speaks French, Swahili and Lingala, says she often served as a translator for African immigrants who spoke little or no English. Yet, despite her linguistic abilities, Bunzigiye says her interpretations of parents’ words were often discounted, even belittled, by teachers and administrators as “her own opinion” and not necessarily reflective of the parents’ true sentiments. Bunzigiye says she was even criticized for doing “too much advocacy work” on behalf of African-born families. Bunzigiye says such experiences reflect those she had as a student and new American. She cites an incident that occurred shortly after her arrival at BHS, when she was given an assignment to write an essay about a film her class had seen. Bunzigiye recalls being so moved by the movie that she wrote five pages. Other staff of color who have worked with immigrant students point to similar incidents in which faculty, staff or administrators openly displayed ignorance, insensitivity or patronizing behavior toward their foreign-born students. Lindsay Reid is an African American woman who grew up in Burkina Faso. Beginning in the fall of 2008, she worked at Burlington High School as an AmeriCorps volunteer assigned to nonnative English speakers. Reid says she was “shocked” by the insensitivity several faculty members showed toward recent immigrants. She recalls one teacher who routinely referred to them as “dumbasses,” and another who labeled a student “retarded” simply because he came from a nonliterate culture. Another time, Reid recalls getting a phone call from a teacher about an African student who showed up in class wearing clothes that were very dirty and needed laundering. When Reid arrived in the classroom, many students were holding their noses and laughing. They weren’t alone. Reid, who now does international development work for Tetra Tech ARD in Burlington, says that, prior to her AmeriCorps experience, she wanted to teach in Burlington schools. For her part, Collins says she doesn’t believe the district has an attrition problem that is specific to people of color. Nevertheless, she says the district has been “working really, really hard” over the last two years to “change the paradigm” on cultural competence. “I couldn’t possibly deny that somebody may have left because they did not feel welcome, or the job was not the right fit, or the district somewhere along the way let them down,” she says. But while some are critical of recent staff losses, Collins prefers to focus on the progress the district has made in the last two years. For example, the district now evaluates all candidates for faculty employment based on their cultural competence. As part of the screening process, all candidates must answer three essay questions on diversity; anyone who scores low on that part of the test isn’t granted an interview. Last year, Collins adds, the district hired a company called Consortium for Inclusion and Equity, to train schools’ hiring committees on issues of cultural competence. Since its adoption, all faculty members in the district are going through the three-hour training program. Additionally, she says, last week the district sent out “cultural competence assessment” surveys to all schools to help administrators better identify “trouble spots” in each school and provide additional training and support, where necessary. On Thursday, the Burlington School Board is hosting a town-hall-style meeting to gather comments and feedback on the task force report on diversity, equity and inclusion that was released last October. The goal, says board chair Keith Pillsbury, is to help the district create a five-year strategic plan for creating a more inclusive learning environment — for students and staff alike. “We have to listen to the information we get when we ask the tough questions,” says Collins. The Burlington School Board is holding a town-hall-style meeting to help shape the district’s strategic plan on diversity, equity and inclusion on Thursday, February 23, at 4:30 p.m. in Burlington City Hall Auditorium.